This post helps you to get information about different cargo container types used for transport of goods. Different types of containers are used in domestic and international trade to move cargo from one location to another. 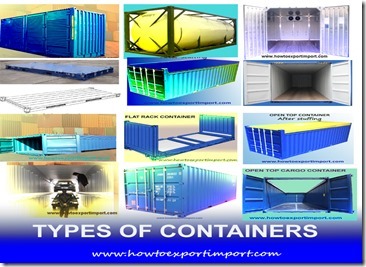 Some types of containers are Standard Dry Containers, Open Top Containers, High cube Containers, Refrigerated Containers (Reefer Containers), GOH Containers (Garments on hanger containers), Open Side Containers, Tank Containers , Half height Containers, Ventilated Containers, Car Carrier Containers, Hard top Containers, Insulated Containers, Tunnel Containers, Platform Containers, Flat rack Containers etc. These containers are used to transport different types of goods as per convenience, coastwise and time saving parameters. For example, Standard dry containers are used to move general dry cargo, temperature sensitive cargo is moved with refrigerated containers, liquid and powder type goods are moved with tank container so on. So each type of container is manufactured as per customer’s requirements. Detailed article about each type of container has been described in separate post in this website to make you easily understand about each container. You can click below links to learn more about types of containers. I hope, you will have a clear idea about different types of containers used, use of different types of containers, specification details of each container, manufacture details and other features of each cargo used in domestic and international trade. Did you like this article about different types of cargo containers? Do you wish to add more information about types of containers and use of each container types? 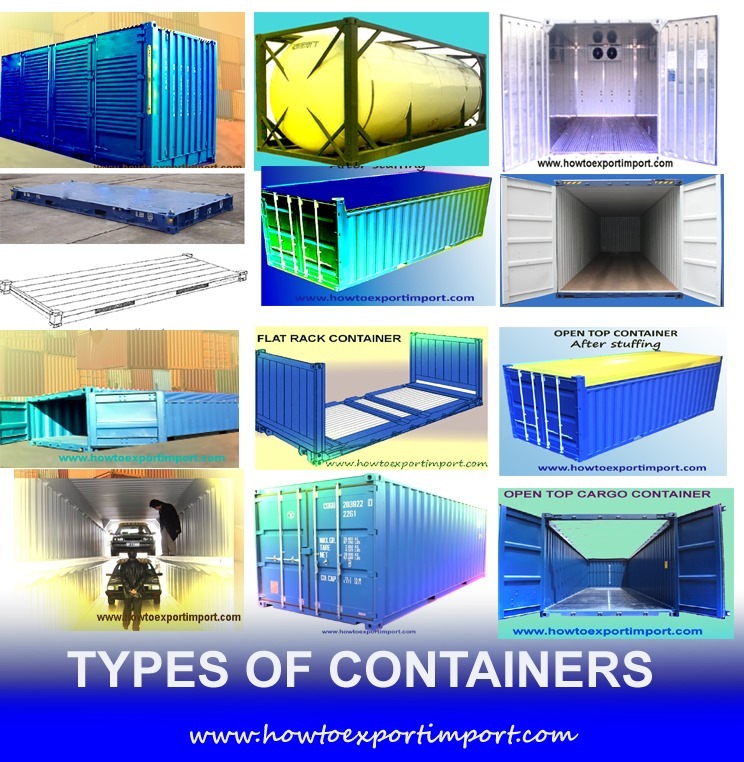 Share below your experience about different types of containers, features of different types of containers and specification of each container types. Comment below your thoughts about this article - types of containers. Difference between MBL and HBL. How to calculate chargeable weight for airfreight in exports? sujit paswan : On 10 August 2016 This is Sujit Paswan, completed my graduation from IGNOU, and want to learn more about Import and Export. I am currently working in Oil Manufacturing Company with purchase department but I need more practical knowledge in Import and Export. Please guide me Sir, what should I do to gather more knowledge on Import and Export. Who is a Service Exporter?